The South Carolina Association of School Administrators (SCASA) has named two school leaders from Lexington-Richland School District Five as 2019 award winners. 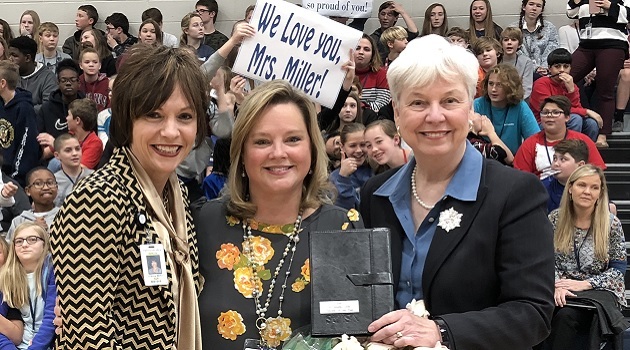 Anna Miller, principal of Chapin Middle School, is the 2019 South Carolina Middle Level Principal the Year, and Dr. Michael Lofton, principal of Spring Hill High School, is the 2019 South Carolina Secondary Principal of the Year. The criteria used in the selection of this award are set by the National Association of Secondary School Principals. State sponsors are Horace Mann and Herff Jones. SCASA, the professional organization for school leaders in South Carolina, has more than 4,300 members. From professional development opportunities and research, to publications and legislative advocacy, SCASA’s focus is to support school leaders in providing the best possible education for South Carolina’s young people. As a state affiliate of three national associations for school leaders, SCASA also works on the national level. SCASA’s recent state-level winners have gone on to win national awards, including the 2018 Secondary Assistant Principal of the Year, 2018 Secondary Principal of the Year, and 2019 Secondary Principal of the Year.